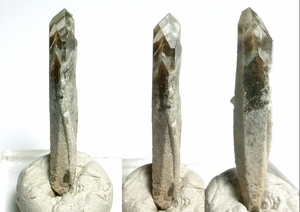 Slightly curved doubly-terminated laser crystal has chevron multi-layered dark green chlorite phantoms...is partially occluded and has an extra prism face [making 7]. 1/4x 1-5/8" long, a 1/8x 3/4" occluded doubly-terminated rider actually curls around two prisms of the host, and a 1/16x 5/16" crystal penetrates also. Main channel face showing two fleabites with our 10x loupe, otherwise, no damage. Quite unusual, and from Garland County, Arkansas.